Whiplash is an injury to the ligaments and tendons in the neck when it is moved forwards, backwards or sideways, often as the result of a car crash. After an accident, the symptoms of whiplash may not be felt until around 6-12 hours later and may become worse over the following days. Whiplash symptoms include neck pain, stiffness, tenderness, reduced neck movement and headache. Women are more likely to experience whiplash than men. Whiplash accounts for more than three quarters of all injury claims after road accidents. 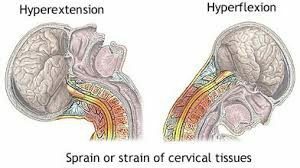 As well as traffic accidents, blows to the head, particularly during sports such as boxing or rugby, or a slip or fall that causes the head to suddenly jolt backwards can also cause whiplash.